The Scott Hall story in question is one of wrestling’s few happy endings, and one which few of us watching the decline of Scott Hall at the start of this century could have seen coming. Hall’s “demons” (that wrestling world catch-all for alcoholism and drug addiction) were some of the most public, with WCW actually making Hall’s inebriation part of its storylines at times. Then, following the collapse of WCW (and the popcorn fart that was the NWO’s brief return to WWE), Hall became notorious for turning up to a variety of indie wrestling shows in different states of disarray, working under the influence (if he even made it to the ring at all), or simply lumbering around in a drooling stupor while fans felt sad and confused. It would have been no surprise at some point during this time, to have woken up to a headline that Hall had killed himself, overdosed, or simply died from too much poison in his body over too long a time. But, thankfully, that didn’t happen. Instead, Hall finally got help from Diamond Dallas Page and Jake “The Snake” Roberts, moving in with the two legends and rehabilitating both his body and his mind through therapy, love, and not a small amount of DDP-yoga. The story ends with the 2014 WWE Hall of Fame induction of Hall, under the moniker of Razor Ramon – something many of us never thought we’d see happen – and his return to the fraternity of the WWE Universe as both a legend and a teacher down in NXT. 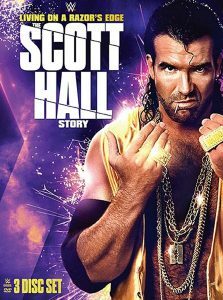 Much of what I have just said is already well known to most wrestling fans, so some may ask why this, already public, Scott Hall story needs a DVD/Blu-ray release. The answer is simple – besides this three disc set containing a great collection of matches and promos to celebrate and spotlight Hall’s legendary career – it is also worth noting that, despite the consequences of Hall’s demons and recovery being well known to us, the actual reasons behind Hall’s addictions – the why necessary for understanding the what – are, until now, hitherto unknown, and the documentary portion of this release gives a candid insight into Scott Hall’s past, the tragic events that traumatized him and set him off down the path to addiction, and direct testimony from Hall himself about what was going on with him over all those many dark years. We also hear from friends and colleagues alike about what was going on behind the scenes and beyond the clickbait headlines. As a result, I personally changed my whole view of Scott Hall. Growing up a massive Razor Ramon fan, and seeing “The Bad Guy” go from massive success in WWE to massive success in WCW, I had always just assumed fame got the better of Hall, and the excesses of success led to his addictions, along with the usual wrestler-on-the-road stresses that seemed to lead many grapplers of the previous generations to drink and drugs. If I’m honest, I became disappointed in Scott Hall. I felt he let me down. But this documentary shows a far more complicated picture of a man struggling with some wholly serious psychological trauma. A man who somehow managed to find the success he did in the squared circle despite the demons dragging him into his abyss. Hall comes across as someone we must have compassion for, someone who, to quote JBL, “smells like fire because he’s walked through hell”, making this one of the few WWE documentary sets that actually could sell as a single disc documentary alone. You don’t even need the excellent matches and extras on the other two discs because the first disc – the documentary – is so damn good.